The Vatican came briefly into public view recently when a document seemed to make the ordination of women equivalent to paedophilia among priests. A Vatican spokesman later said that no equivalence was intended. Paedophilia was a crime against morality. To participate in the ordination of women was a crime against faith. The view that the ordination of women in the Catholic Church is a crime against faith bears some reflection. The logic of churches naming 'crimes' is clear enough. Any organisation will have its expectations of its members, and breaches of those rules can be sanctioned. A football club will demand that players attend training and arrive sober. To arrive late and drunk will be seen as an offence against what is expected of the player as a footballer. But players will also be expected to respect the symbols of the club. If he publicly burns the club flag and jumper, he will offend against what is expected of him as a clubman. It is an offence against what the club stands for. An offence, we might say, against its faith. Church law works on the same principle. The language reflects a time when the Church was the lawgiver for Christendom. Although clerical paedophilia and participation in the ordination of woman are totally different, both have been declared to be incompatible with life in the Catholic Church. So they can be sanctioned. But I found the naming of participating in women's ordination as a crime against faith disconcerting. I had recently attended the ordination of a woman friend in another church. The ordination service was much the same as the Catholic service, expressing the responsibility of the church for ordaining the candidates and their accountability to God and the Church in their ministry. The celebration was prayerful and joyful, and promised to be the prelude to a fruitful ministry by faithful and committed candidates. It was thoroughly faithful. It seemed impossible to say that the ordination of this woman in that church was a crime against faith. Nor indeed was it conceivable that the ordination of women in that church was against the faith of that church. To describe as against faith an action that was based in faith in Christ, that served the faith of the church, and came out of the proper order of a believing community, seems quixotic. It would seem more accurate to describe the ordaining of women in the Catholic Church as primarily an offence against order rather than as an offence against faith. That is not to minimise its significance. Order has to do with faithfulness to Christ in the patterns of church life. A properly regulated ministry is central in the order of any church. To ordain women without authorisation in the Catholic Church attacks the principle that ministry should be licensed and also breaches one of the principles that are built into the licensing — that ordination be restricted to men. This principle, of course, is grounded in the understanding of faith, but the ordination is directly an offence against order. It is like the action of someone who trespasses on military facilities in a protest against the war in Afghanistan, or arranges a ceremony in which they are invested in police uniforms in protest against police brutality. The trespass and wearing of uniform are against the ordering of society. They also involve a judgment on the ethical underpinnings of that society, but they are not named crimes for that reason. In both these examples, however, the breach of order is accompanied by a judgment of the ideology that underpins the way in which order is constructed. The protest actions are passionate. They challenge the ethical foundations of society. That is why the response to the actions so often seems disproportionate. The actual challenge to order by a few unarmed people stepping on to forbidden land is minimal. The symbolic value of the gesture explains the harsh penalties often imposed. Similarly a few maverick ordinations are more a diversion than a threat to the order of the Church. But they do represent a passionate challenge on ethical grounds to the traditions that undergird Church order. So in that sense they do touch on faith. They are prophetic gesture, and churches know the power of apparently quixotic prophetic gestures. The Scriptures are full of them. So they are taken seriously. The difficulty with prophetic gestures, of course, is that the more harsh the response to them, the more they make people ask about the legitimacy of the traditions to which they draw attention. Where there is dissent, sometimes it is better for societies and churches not to focus on penalties, but to settle in for the long haul and engage with good humour with one's mavericks. I really wonder how much of what is attributed to the Pope is embroidered? His pronouncements on many topics indicate to me a man twenty years beyond his prime. Then we come to the Vatican bureaucracy ... merely an Italian enclave for flunkies of that nationality. I am sure they all want to keep their cherished seats warm and so will say anything which makes them secure. Whilst I am not in favour of women priests in the Catholic Church, to term the consideration 'evil' indicates the sick minds of the Vatican proleteriat. Andrew, you have named the problem well - it is not a crime to "participate in the ordination of a woman". Indeed, I could ask what does it mean to "participate in"? Did your attendance at the ordination of a woman in another church constitute "participation in"? It is my view that eventually, after perhaps what seems to be too many "quixotic prophetic gestures", the church will come to accept that not only does God lay a priestly, or even episcopal, call in the hearts of some women, such a call, and the response of the church by ordaining them will actually strengthen the pillars of church order rather than weaken them. Thank God faith has little to do with the Vatican and the prats who rule over it. The daily ecclesiastical foot in mouth clearly demonstrates that God has a sense of humour and that the big ‘C’ Church is living in La La Land. Thank you Andrew. I was beginning to think this statement had passed without comment because people thought it so ridiculous as to be irrelevant. Personally the statement from the Vatican only reinforces my belief in the total irrelevance of Rome and the Vatican to today"s church. The Christ story was all about inclusion of the marginalized and reduction of the power of the hierarchy, sadly in my opinion Rome seems to have forgotten all about this. I didn't take any notice of Rome 40 years ago when they said we could not attend a service at a church of another faith because I found nothing Christian in that edict and I have managed to live a relatively good life and I certainly do not intend to take any notice of this latest edict as I find it far more offensive. It is we the extraordinary, ordinary people who are the face of the Church in everyday society and I believe, generally have a lot more credibility. I know I will regret hitting the SEND button but someone needs to say something. Interesting argument about relationship between rules and order. But surely order in this case becomes a euphemism for concreting that which is illogical, archaic, the embedding of a social order that does not match contemporary reality. Vatican opinions on the value of women as exemplified in rules on women as priest, women as decision-makers about their own bodies neither matches contemporary realities or natural human justice. As a woman, obviously this statement of ordination of women being a crime against faith has angered me. Morality is the nexus of all church teaching, and I argue this authority has been ransacked over the centuries with corruption and political positioning allowing war and genocide directed in the name of God. If the church is serious about crimes such as paedophila, there should be a reversal on rules of celibacy for priests. There are shortages in vocations in the western world due to social isolation and recent alienation of these men, I believe. Women have unique authority in the social and moral order of life which have been ignored and patriachial perspectives miss half the message of Christ's teaching. Token respect for women has caused much of the church's problems. Are we seen to have only token faith as well? The churches are very different in the way they talk about the same subject. Indeed, the very terms of discussion can lead one to think that they not even talking about the same thing. When the ordination of women debate first arose publicly in the Anglican Church the lingua franca was theology. For some people, much turned on the precise meaning of something called apostolic succession. For others, the meaning of the phrases “neither slave nor free” &c. were an obvious argument. When the present Archbishop of Canterbury last visited Melbourne he was asked in a public place why women should be ordained. He replied that he had thought long and hard about this question before understanding that the women had been baptised. He then he moved on to another subject. Andrew Hamilton is finely tuned to the moral use of words and knows when something might not be a crime. Yet his excellent rebuttal of loose language here reveals how far the Catholic Church has to go, when the discussion is all about authority and power and dominion, and not a word about Bible or theological reason. I look forward to Chapter Two. This was an interesting article - but I still don't see how women ordination is a crime against faith or order? Who made these rules. I don't recall in the Bible Jesus stating that man shall only be priests? This again, is another example of Men making up rules. They simply want to follow tradition - and thus this is similar to the Muslim religion - where they follow tradition and keep women subordinate. The Vatican is no better than the Mullahs. I just think that if a woman who has received the calling to be a priest - should be allowed the opportunity. God does not discrimate - man does. In seeking to end speculation about the ordination of women to the Catholic ministry Pope John Paul II in "On Reserving Priestly Ordination to Men Alone" relied on earlier pronouncements and the tradition of the Catholic and Orthodox churches and of course the fact that Jesus did not ordain women. Surely our faith is that when Jesus conferred the power of the keys on Peter and his fellow apostles this was a plenary power to bind and loose. Why cannot a General Council of the Church, as recently called for by Father Kung and others, review this question free from the limitations imposed by those who have gone before. I too last year in Dublin attended the ordination to the Church of Ireland priesthood of my niece in a most impressive ceremony. Thank you for another fine contribution Andrew. I noted in one response that the writer said words to the effect that people had not responded widely to the pronouncement of the ordination of women being a crime against faith because it was irrelevant. It really is irrelevant to my faith - the old boys' club is in full working order and the top of the dome of St Peter's will not shatter for some time to come. However, the Berlin Wall fell so there's hope. I pray that some day women may at last be equal to men in all aspects of life including becoming priests in our Church. Discussions such as this always cause me to question why people would want to align in any way with an organisation that so publicly espouses positions that are untenable. Could someone explain to me what is the common element that you would have with an organisation that regards the ordination of women and paedophilia to both be a crime? Andrew's distinction between faith and order is useful in the context of the women's ordination. The distinction does provide a base for understanding why penalties and sanctions seem disproportionately harsh. I thought it a pity that Andrew spoilt his contribution (for me) with the final paragraph. I was supporting his contention that dialogue is always superior to the use of power when resolving problems. However, Andrew seems to have adopted a patronising tone in his comments about engaging the maverick with humour. Mavericks are people with alternative views to the establishment, and as such should be engaged in dialogue with sincerity. For the maverick, the issue is serious and he/ she does not deserve to be treated with some form of humourous disregard. The Church hierarchy has some history in insensitively dismissing alternative views (and those who hold them), which seems out of character with Paul's reminder that " there is nothing that Love can't resolve." Too often our Church leaders resort to authority and power rather to loving dialogue. Perhaps the former allows for the exercise of "humouring", while the latter adopts a much more respectful approach. Can we hope for a future of respectful dialogue, in which those who are seen to be different are welcomed, rather than singled out for "humourous" engagement?? Tony Abbott was pounced upon earlier this week by asking whether Julia Gillard "..meant no when she said no"...pounced upon because of the sexual connotation of the phrase, especially as he was directing it to a woman. Equally, the Eureka Street editors court the same anger by titling this article as "Women's ordination and other crimes of passion". That's just, unforgivably obnoxious. Too late now, but "Women's ordination and other acts of passion" would have been more appropriate. The editors' title, for me, completely devalued his description of the ordination service he attended. It then rang very hollow indeed. 'Crimes against faith' too has its own different connotation..one which the church also has a disgusting record, noted in the horrors of the Inquisition...when one man's faith (or a woman's) was matched against the yardstick of torturers acting for those of blind faith. The church has for too long sought to afford order as its own passport for so many disorders. History repeats itself..the overturning of tables in the temple two millennia ago should be ringing loud and noisy bells..especially for teachers of theology. Jesus never did proclaim that only males should be priests...indeed recorded history does away with that...but the church assumed a preferred position that's not at all supported by the whole Body of Christ. "It would seem more accurate to describe the ordaining of women in the Catholic Church as primarily an offence against order rather than as an offence against faith. Order has to do with faithfulness to Christ in the patterns of church life." Andrew your wordy attempt seems like an apology to women, but it really does not help us to feel better about being excluded from Church leadership roles. The priesthood as it stands offers a perfect refuge for those who for one reason or another fear the female gender, and this is why Rome has made the connection of paedophelia with women's ordination on a single Vatican document. Their persistant refusal to recognise the true worth of women is a crime against humanity and is grossly offensive and unfaithful to the work and teachings of Jesus of Nazareth. Is each of the ten commandments equivalent to the other? Is "Thou shall keep holy the Sabbath Day" equivalent in moral, religious and social value to "Thou shall not kill". Does the Third Commandment require us only to act positively on the Sabbath or does it forbid certain behaviours? Does the Fifth Commandment forbid all killing? Just what does the Vatican mean when it calls some action "a crime against morality" and another "a crime against faith"? I find it hard to believe that members of the Curia are as well educated as they are supposed to be when they use language (whether in Latin or the vernacular) so imprecisely. The gross misogyny promulgated in the Vatican declaration against women's ordination is untenable and unacceptable in 2010. The hierarchy of the Roman Catholic Church cannot claim credibility in legislating for the debasement and exclusion of women, which is totally contrary to the Gospel and the teachings of Jesus Christ, who the Church purports to represent. I feel I can no longer I belong in an institution which champions such gross hypocrisy. The Vatican pronouncement of 15 July 2010 concerning the ordination is a "delicta graviora" against human dignity and the equal rights of women. The vast majority of thinking Australian Catholics are voting with their feet. Our churches are emptying due to this intransigent, antiquated, patriarchal thinking which cannot be substantiated in any realistic terms. A petition is currently being launched to broaden awareness and encourage concerned Catholics to express their view. While I thank Andy for yet another splendid article, I would like to take up the comment Noel Will. Noel, you have expressed what I think is in the back of the minds of many Catholics who read that the ordination of women and the crime of paedophilia have been compared as equal evils. This is a shocking comparison. Having said this, I am also mindful that one of my greatest surprises in life has been to discover the rich treasures held in many Vatican documents. I believe one of the missing elements of our rapidly evolving world is wisdom. While acknowledging the horrific damage and harm to the new holy innocents among us, still might we hold during the storm to consider that we may be suffering the same condition as the object of our derision? When a female Catholic wishes to be ordained to the priesthood is not a crime. All she has to do is to study the CCC 1551. When males and females Catholics insist that women should be ordained to the priesthood, they commit a crime of disloyalty to our Holy Mother the Church and they become dissenters. Sometimes I wonder if I logged on to a Catholic website or to CFR or ARC websites. What really upsets me is that the Church, while it has ruled against ordaining women, still has not made way for women to exercise the leadership they have by virtue of the common Baptism they share with men. Priestly ministry may rely on males as they somehow share the male nature of Jesus Christ, this probably needs further study and prayer, but prophetic and governing leadership certainly does not and has never been seen as being restricted to the male. It is certainly long overdue in our Church for women to be given their rightful place in sharing in the leadership of our Church. Really don't get why people who are so against the Church and what she teaches bother staying... just go! There are plenty of options for you within the Christian sphere. The question of women's ordination is closed. If that offends you, if you can't accept it, no-one is making you stay. I'm young, recently "reverted", and completely with the Church on this. That didn't come automatically. I had to read and reflect a lot on my way back into the Church. But having already experienced how surprisingly spot on the Church was in so many of those "counter-cultural" teachings, even while I wasn't fully convinced, I was ready to give her the benefit of the doubt. If you can't do the same, if you genuinely believe the Church is discriminating unjustly against women, oppressing them, treating them as second-class, I simply cannot comprehend why you would stay. Under what circumstances does the the statement one is committing disloyalty to our holy mother the church constitute an argument or basis for discussion. As well written as it is I'm not terribly comfortable with the closing tone of Andrew's article. To my mind women's ordination is not so much a challenge to church order as it is to male privilege. The theological argument against women in ordained ministry is flimsy at best. In this, as in the argument against a priesthood open to married men what Rome is defending is a clerical caste system. We have an apartheid church in which gender determines access to privilege. Well written Andrew. I agree with almost all that has been written concerning this issue on female ordination. I am a practising Catholic,not from fear (as was the case pre Vatican 11). I reserve the right as possessing God given free will and reason, to disagree with a most unholy decision which is not intrinsic to my faith in Jesus. A reading of history will reveal many occasions when decisions made in the name of the Church have later been found wanting. This maybe one of them. There is absolutely nothing in Scripture preventing female ministry in the Church. It worries me greatly when Rome issues such edicts without any justification what so ever. As far as I am concerned while I wish to remain within the Church and to play a role in parish ministry, I do not feel disloyal if I happen to disagree with a matter which is not part of the core beliefs (as expressed in the Creed we recite each Sunday ) of my following Jesus. I do wonder what He would have to say on the issue. meg asks why do we stay?? It's simple; because we are the church, we are the living body of christ. The whole message of salvation is entrusted to us,not just the hierachy. We are loyal, it is our church and we are- staying- praying working- serving- the the world. I don't know, Andrew. I've always been a bit dubious about "prophetic gestures" that go with the mainstream cultural flow. I've become uncertain about whether God intends women to be ordained - in fact, I find I'm less and less able to say "I'm certain" about much to do with God. However, I am very interested in the lack of rational theological argument for the Vatican's position. It must be hard for them, poor souls, to develop arguments properly rooted in Scripture when their own Scripture scholars can't find proof texts, despite being instructed to do so. (And the Pontifical Biblical Commission certainly was told to do so). As I've never felt a call to ordained ministry, I can afford to be lazy and selfish about this issue, I suppose. However, I'm constantly horrified that leadership in the Church is confined to the ordained. This makes no sense at all to me! Andy, i have long read and listened to your wisdom. Today i must, however, cry "Enough". I have grown tired over the years of Church men [sic] rationalising the Church's stand against the ordination of women based on spurious interpretation of Scripture,etc. Your reasoning runs the risk of being termed " jesuitical". Sadly the tone of your last two paragraphs is rather patronising to the well over 50% of faithful Catholics who are female. Let the discussion be about the " legitimacy of the tradition" than about WORDS. Thank you for your comments. A sufficient number of you found my last paragraph condescending or patronising that I am dissuaded from defending it as it stands. Clearly it was badly written. But I do think the point I was trying to make about the proper attitude to people who act counter to the law out of moral conviction bears reflection. I have a number of friends who have been taken to court and many jailed for trespassing on military facilities, pouring blood on weapons, and so on. Societies often respond to such actions by imposing increasingly strict penalties and by adopting a rhetoric that effectively excludes them. I think it would be better for society if it were to engage with the protesters in a tolerant way that involves listening and arguing the issues at stake. Similarly, within the church over gestures of protest. Some of my friends, of course, would prefer society to be punitive rather than tolerant, because that sharpens the moral claim they are making. I respect that. But I do not believe that the society benefits from being punitive. It would of course benefit from reflecting seriously on the attitudes that led to the protests. I like the word 'jesuitical' as a description of Andrew Hamilton's article. To compare the Body of Christ to a football club or an army in Afghanistan is surely a gross category error. To attempt to ordain a woman to the Catholic priesthood is a crime against the Sacraments and thus a crime against faith. Christian faith is about the submission of one's whole self to Jesus the Christ. In Christendom there is only one priest, the same Jesus the Christ. He is the spouse of the Church (which is one of the reasons why priests have traditionally been called Father). To call a woman to the priesthood is spiritual lesbianism. I am astounded that there seems to be a failure to find biblical support for this. This is a profound inability to grasp the +reality of Sacred Scripture and its implications. I would start from Hebrews and work backwards, assuming of course that Pentecost had already occurred. Alex, Alex, I have to believe that your comments are satirical. so subtle it almost got me in. 'spiritual lesbianism'! you're a scream!! I dont think we should try and dissect the detailed and obscure arguments about women clergy in the Catholic church. Since most Western Catholics do not accept the thinking of the Church on this issue anymore than they accept the arguments on contraception it is inevitable that we will at some time in the future have women clergy, even women bishops and even women cardinals and after that who knows. The equality of men and women in the Australian workplace will inevitably flow into the Church so dont bother playing with words and lets just get on with being true followers of jesus and ignore the flim flam..
Well said, Andy. Gavin's response wondered what Jesus would have to say. I suspect we simply have to look at what is happening today for an answer. Certainly in New Zealand and I guess in Australia too, many women are taking leadership roles in the church albeit not in sacramental ministry. In most dioceses in NZ the decision has been made against ordaining deacons because these men would take the roles that many women are legitimately and amply filling. Surely, in working with what is possible, we can open the institution to increasingly egalitarian approaches to ministry, at least at the grassroots and on the margins, where Jesus put his energy. I am a simple Catholic, not into big arguments about the Vatican and its order. All I understand on this matter is that Jesus chose 12 men (not women) to be his apostles. He did not choose Mary Magdalene. The Catholic Church is an Apostolic Church (the 12 apostles of which 11 continued to spread the Christian faith). Jesus said to his apostle, Peter: "You are Peter and on this rock I will build my community. And the gates of the underworld can never overpower it" (Matt 16:18) ~ this our Catholic faith. Sorry, "NO" to women priests no matter how short of male priests we are - let us follow Jesus in His way when He chose his male apostles. I see our priests as the succession line to Jesus' chosen apostles. Women can serve God in numerous other ways - all other ways are just as important as priesthood if one carries out one's duties to others in holiness and spirituality according to one's faith. Can I mention here, "Mother Teresa of Calcutta"? Advocacy of the ordination of women is a crime against church order precisely because it is, firstly, a crime against the faith. The order of the Church is in place to support the faith of the Church, not the other way round. Anglicans and other Christian organisations stemming from the Protestant Reformation can style their ministers 'priests' and the commissioning of those priests 'ordinations' if they like, but this is not the same as the sacrament of Holy Orders instituted by Christ the Lord and preserved in the Catholic and Orthodox Churches. In accordance with the exercise of both the ordinary universal and extraordinary magisterium, which engage the gift of infallibility, the Church has no power to confer the sacrament of Holy Orders on women. The Holy See is right to point out that to gainsay this article of the faith is indeed a crime. Rose, did you know the first hundred years AD saw lay priests, married men (and therefore women) keeping the message alive? Christ's teaching was and still is revolutionary...otherwise it is hypocritical and more concerned about worldly power. Given the social mores of the time, it is not surprising that all the Apostles were men. However, if Jesus Christ were to come amongst us today to set up a Church, I wonder if He would appoint only men as his Apostles. How does one know whether the Church’s attitude to the ordination of women is based on divine or church-made law? Some guidance would be helpful. Thinking back to my youth, eating meat on Fridays was taught to be a mortal sin – a Church law. The Church rescinded this law. 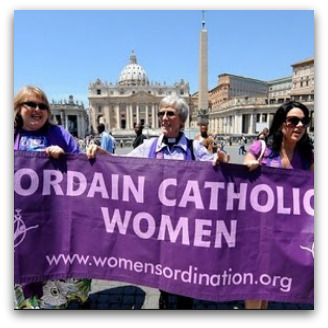 If the ordination of women is against Church law, surely it can also be rescinded. If it is against divine law, where is this law located? Is the Church in danger of being caught in a time warp on the matter of women’s ordination? This is a particularly well-argued article, Andrew. It names the challenges all-round extremely effectively. One of these days the estimable editors of the Street will have to write an editor's note noting which pieces got the most responses -- now there's an interesting measurement of what readers are jumpy at and intrigued by, yes? Did Andrew set a record here for flurry of reply? I also remember the American writer Mary LaBarre pointing out that while all the apostles were male, all the paying of fees for Christ and His companions on the road were paid by women. So then, if we are to stick with the original plan, priests can only be men, but women hold the Church's pursestrings? I'm good with that. I too found the last sentence in this article patronising. Prophets were often considered to be mavericks, Jesus himself was considered a maverick in his time, so was Galileo. I'd say supporters of women's ordination are in good company. Why is 'priesthood' considered by many women as 'the great prize'; the thing that will validate their status and participation in the leadership of the Church? Why is 'priesthood' trumpeted by pro-ordination women as the means by which they will finally 'find their place' and 'share the power' of the clerical men, who in their eyes, run this Church? I am troubled by the exaggerated beliefs of many women (and men) that priestly ordination is their ticket to success, power, access, influence, position, status... I DO believe that women face additional challenges within the structures of the Church, but I DON'T believe that the 'priesthood' is the 'holy grail' of influence and power that they seek. I know too many priests whose humble, ordinary, unglamorous (and fruitful!) lives would disprove this. I can't help but think that much of the pro-women's ordination lobby are actually motivated by unhealthy and un-realistic ambition. I hear women who have basically suspended growing in ministry and mission, because they cannot be ordained... that is really sad. With eyes fixed on Jesus and with hearts full of zeal for the Gospel none of us need feel 'disabled' by a lack of formal recognition by the 'powers that be'. That's my 2 cents worth. Re "Meg" comment dated 05 Aug, "I simply cannot comprehend why you would stay." It's our CHURCH we're talking about here, not a political party! We don't just bail out over differences. Can you comprehend that? But that's the thing, Loreto Educated, people do bail out all the time and find themselves a church that suits their tastes. We're not talking about a minor difference. If someone truly believes an institution is sexist, anti-women, failing to recognise their true worth and dignity, in fact oppressing them by keeping them subordinate... why would they continue to remain part of such a grouping? I don't think those things, and am happy to call myself Catholic, but if was convinced the Church was completely misogynistic (as so many commentators here seem to be), there's no way I could associate myself with her. Meg I am past anger I am just sad. I can't blame the men for not standing up on the issue of women's inequality in the Church. I can't even blame you for not thinking what we think. But the fact that you would blithely dismiss out of "your" Church all the women (and men) who do not agree with your view underlines the real horror of the Vatican's attitude. Think as as we think or get out. Do you really think the Church is better off without us? When you answer "Yes", I say that I think Christ might answer differently. If "my" view were the accepted one in the Church I would not want you to leave. Strange isn't it? Actually Meg, your use of the words "institution" and "grouping" betray much. We're talking here about the Living Body of Christ in the Church. "You did not choose me, but I chose you" (Jn 15:16) and you're still suggesting folk find another church that "suits their tastes". We are bound to the Church even if we question the whole flippin' lot: papal infallibility, contraception, celibacy in the priesthood and women's ordination. God gave us the minds to think and the nature to ask and the spirit to disagree. Some people were burned at the stake so we could have the right to do that and still be wholly committed, devoted members of that same church today. Today and always. It would be regrettable if an attack by Cardinal Pell and the Australian Christian Lobby on the 'anti-Christian' Greens could be construed as an indirect shot across the bows of the atheist Prime Minister. On some policy issues the Greens have a more Christian message than the major parties.